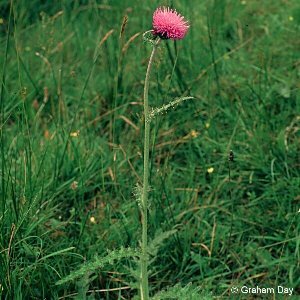 This species is known as the Meadow Thistle or the Bog Thistle and is a tall spiny thistle of damp and peaty ground with an unbranched, unwinged and non-spiny stems bearing a solitary flower head. There are weak spines around the edges of the leaves. Frequent in the west of N. Ireland, less common in the east. All names: Cirsium dissectum (L.) Hill; Cirsium anglicum (Lam.) DC. ; Cirsium pratense (Huds.) Druce, non DC. ; Carduus pratensis Huds. ; Cnicus pratensis (Huds.) Willd.